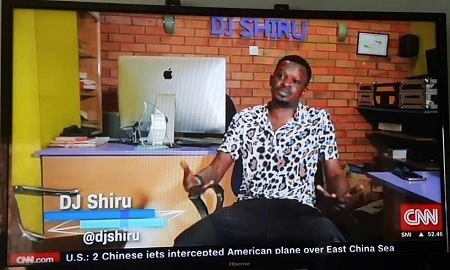 DJ Shiru is a man of few words.."256 Spin Doctor, Wayasehh, I signout...Kaboom" Are the words he normally uses in some of his music videos when he decided to venture into music to supplement his DJ skills. 'Dance Well' featuring Pato Ranking, 'Lighter' featuring Apass and Deyaso are some of his songs. He is good at his thing and has sessions at all the international concerts and local performances and while he does his thing, you can't miss to see the crowd go wild as compared to other DJ's. When it comes to awards, he has literally won all the awards for the Best DJ Nod, in fact, some were of the view that he should just pull out of the awards at least to let the others win. Those are some of the highlights that forced the team from CNN African Voices to DJ Shiru for an interview. We are still trying to get the full interview. he is right now in Dubai for the 'Dance Well Dubai Season Closing Party' slated for Saturday (May 20) at Las Vegas night club.